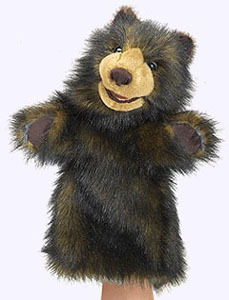 With their hand inside the body of these life-like animal puppets, children can act out their favorite storybook tales. A perfect gift for any child. Links to other puppets are below. 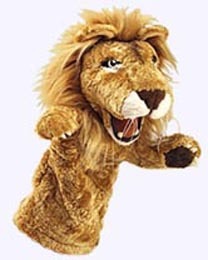 The 13" Lion Hand Stage Puppet features an easily animated mouth and operable paws. Design details include textured paw-pads; thread whiskers, molded claws and teeth, soft vintage-look plush and a very expressive personality! 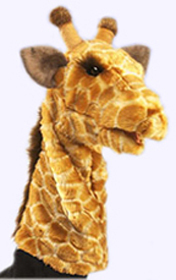 The 14" tall Giraffe Hand Stage Puppet features a soft moveable mouth and beautiful patterning. Design details include suede-like nose and ears, ultra-soft sculpted plush, and its long signature eyelashes. 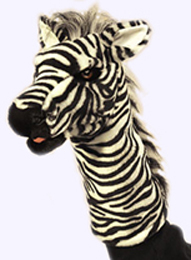 The 13" tall Zebra Hand Stage Puppet features an easily animated mouth and lots of expression! Design details include a leatherette nose, soft vintage-look plush with beautiful striping and a distinctive black and white mane. 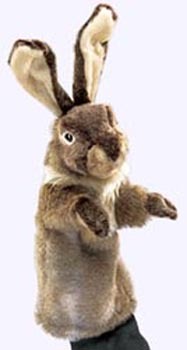 Heirloom-quality details and a rich mix of sumptuous plush make this 20" Rabbit Stage Puppet one any child will enjoy as they tell their rabbit tale. 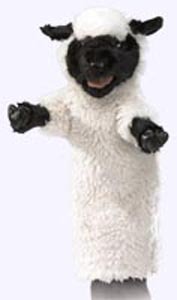 15" Stage Puppet has a movable mouth and front legs. Sized to shake the earth, this 15" 'tyrant king' of the giant lizards features scaly stretch velour fabric, a movable tongue and realistic, soft plastic teeth. 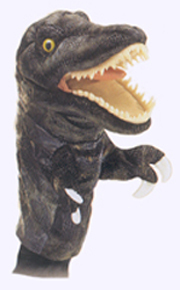 He'll be the terror of the toy chest when you animate the massive jaws and arms of the mighty 'Rex. A puppet show script is provided on the hangtag.